I've been using manual lenses since shortly after I got my first DSLR. I've developed quite a collection of equipment over the years, and quite a reputation among my friends thanks to that collection. I'm going to start a regular feature here on the Prairie Rim Images blog where I highlight a certain piece of vintage equipment every so often. Before I start that, though, I need to lay down some basic info so you all know what I'm talking about. I'll concentrate mostly on old lenses in this post. Flashes will get their own treatment later. Most major camera manufacturers have designed their own special lens mounting mechanism. There are some notable exceptions where different makers have shared mounts -- like the old M42 mount and the new Micro Four Thirds mount -- but by and large, manufacturers prefer proprietary mounts. This makes our lives a bit more interesting. Interesting is fun, right? The two biggest considerations for determining whether a lens made with one mount will fit on a camera made with another mount are the throat diameter and the register distance. The throat diameter specifies how wide the mouth is on your camera body. A wide throat on the body will accommodate a lens designed for a narrower throat. Canon's EOS mount, for example, has a very wide throat into which just about any other lens will fit. 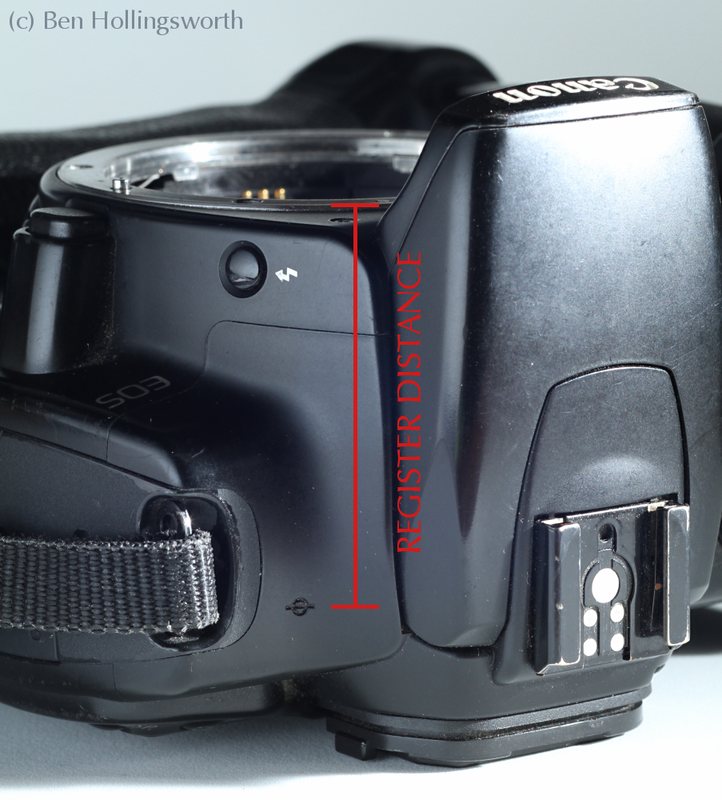 The register distance specifies the distance from the lens mounting surface on the front of the camera body to the film or sensor plane. On 35mm SLR's, this typically ranges from about 40-47mm. The lens is designed to aim its light at that exact distance behind the mounting surface. Moving the lens farther out from the sensor will cause it to focus on objects closer to you, but will prevent it from focusing out to infinity. Macro tubes use this principle to help you take close-up photos. If your body has a shallow register distance and your lens expects a deeper distance, that gives you room to insert an adapter between the lens and the body while still maintaining infinity focus. Canon's EOS mount has a register distance of 44mm, which is shorter than most others. This enables it to mount (with adapters) lenses from Nikon, Pentax, Olympus, Yashica, and others -- but not, ironically, Canon's own older FD or FL mounts. Because the micro-4/3 mount has no reflex mirror to clear, it has a very small register distance (20mm), making it an ideal platform for using older lenses. This link gives a detailed list of the register distance for most camera mounts. The adapters themselves are relatively easy to come by on Amazon, eBay or other retailers. Prices start at under $10 for a simple M42-EOS adapter and go up from there. Most adapter configurations can be found for under $30. Accurate machining is important for a good fit and infinity focus, and some adapter manufacturers are better than others. Alas, the eBay sellers change so frequently that it's difficult to find reviews of which ones can be trusted. Some digital bodies are able to use older, manual lenses from that same manufacturer without the use of an adapter. Frequently, these bodies can also make use of aperture controls that make the user experience a little more automated. For example, Nikon bodies can use any Nikon F-mount lens made since the 1950's, as long as it's been converted to AI mode. Pentax bodies can also use their old K-mount lenses made since the mid-1970's. Canon, Olympus, and Minolta redesigned their camera mounts when they introduced autofocus lenses, and therefore require adapters to use the older glass (if it's possible at all). I talk a lot about Canon bodies because that's what I use. However, if your primary goal is to use manual lenses, the best bodies are either an Olympus 4/3 DSLR or an Olympus/Panasonic micro-4/3 camera, which have register distances of just 40mm and 20mm, respectively. Both of these cameras have smaller sensors with a 2x crop factor compared to 35mm film. But what happens if you find a third party lens (like Vivitar) at a pawn shop and don't know what camera mount it was made for? Rick Oleson to the rescue. This pictorial list illustrates most of the common mounts you'll run across. I keep a printed copy in my Jeep at all times, just in case. When you've found an older lens and gotten the appropriate adapter (if necessary), it's time to try it out. This whole experience will be easier for you if you've already gotten used to shooting in "aperture priority" or "manual" exposure mode, because these old lenses require you to set the aperture manually using a ring on the lens. The first thing you'll notice when you close down the aperture ring is that your viewfinder gets very dark. This is one drawback of using these lenses on bodies that weren't designed for them. Either you have to focus at the smaller aperture, or you have to open up the aperture, focus, and then close it back down before tripping the shutter. Obviously, the latter doesn't work very well in fast action situations. I believe that Nikon and Pentax bodies will allow you to focus wide open regardless of the aperture ring and will then automatically stop the lens down when you click the shutter. This is the way these lenses were designed to work on older cameras from the same era. Speaking of viewfinders, modern cameras were designed to focus automatically, so their viewfinders are intended only for composition, not for accurate focusing. Compared to finders from 1970's bodies, today's finders are very small and dim. The viewfinder on an Olympus OM-10, by comparison, is a veritable picture window. Besides their size, older viewfinders also were typically equipped with focusing aids such as microprism rings or split image circles. A microprism ring is an area of very tiny prisms that cause an out-of-focus item to look very pixelated (to use a modern concept). As an item comes into focus, it will do so very suddenly when viewed through a microprism. A split image circle is a small disc in the center of the viewfinder that's divided into two halves. Out of focus items will show the two halves shifted relative to each other. When the item comes into focus, the two halves will line up with each other. Frequently, an older viewfinder will have a split image surrounded by a microprism ring. Modern viewfinders will have neither of these, although some cameras do have aftermarket focusing screens available with these features. Thanks to the manual focus craze, several third party retailers have made available aftermarket focusing screens that help modern cameras focus more accurately. Often, these screens are taken from old cameras and cut down, although some retailers actually make their own new ones. KatzEye and FocusingScreen.com are two retailers that I've used personally. My KatzEye screen with its OptiBrite treatment is much nicer, but also far more expensive. Replacing the focusing screen in my Canon bodies only takes a couple minutes. You can follow an illustrated install process and read about several focusing screen options in this post. When shooting static subjects on a tripod, the best way to really nail the focus is to use the magnified LiveView feature present on most current DSLR's. By displaying the image on your rear LCD and then zooming in to 5x or 10x, you can see quite accurately where your focus point is. Once you've got all the equipment in place, it's time to get out and practice. For somebody who's grown up with autofocus camera, focusing manually with any degree of speed and accuracy can take some practice. That practices does help. After several years of playing with manual lenses, I've gotten reasonably good at it, although I still have trouble catching fast-moving objects like my kids at play. If I paid my rent with sports photography, I wouldn't dream of using manual focus lenses. However, since most of my subjects move more slowly (or not at all), I find manual lenses to be a fun and inexpensive way to tinker with a lot of different configurations. I mentioned above that there's a lot of gems to be found at pawn shops, flea markets, garage sales, and auction sites. While eBay is certainly the easiest place to find the lens you're looking for, you shouldn't expect to get any great deals there. There are enough other people out there doing the same thing we are that eBay pretty much defines the going rate for most of these lenses. This can work in your favor, allowing you to do a completed listings search for an item to determine if another seller is giving you a good deal. I've paid an an average of about $25 each for the 25 manual lenses I currently own. There is some wonderfully high quality glass out there for less than you paid for the cheap kit lens that came with your camera. Prime lenses, in particular, can be very nice. The optical technology for normal-length (50mm-ish) primes pretty much peaked by 1975, and there have been very few improvements since then. Wide angle and long telephoto primes are another matter, as are most zooms. Another big advantage is that older primes tend to be much "faster" (wider aperture) than today's kit zooms. Old 50mm f/1.8 and 135mm f/2.8 lenses are a dime a dozen. If you want a wide aperture lens for low light or creative effects, this is a great way to get one. If you're curious about the lenses I've collected for myself, check out the complete list. It ranges from 24mm f/2 to 400mm f/5.6 and includes no less than six prime lenses that cover the 50-55mm range and four 135mm primes. The next blog post to discuss specific manual lenses presents my "fast fifty" Pentax Takumars, followed by my Yashica ML 75-150/4, my Tamron 90/2.5, and a borrowed Nikkor-S.C 55/1.2. Differences between the various Nikon mounts can be found in this article. There is a lot more I could say about this, but I've rambled long enough. This is only a blog, not a book. If you've got questions about anything, leave a comment below. Now, get out there and play! I have always been a Canon fan, so I have a few old FT bodies and a small collection of FD lenses that have gone unused for too many years. I would like to start reusing them, so am willing to buy a new body. After following the many links on your site, I came to the conclusion that the only DSLRs that will accept my FD lenses are the Panasonic and Olympus families. Am I correct, or would you recommend some other make? Two years ago, that was pretty much accurate. Due to their short register distance, FD lenses weren't compatible with other DSLR bodies. Unless you wanted to insert crappy optics between your lens and body, your only option was to use a mirrorless interchangeable lens camera body with your FD or FL glass. That's still the case, but your MILC options have grown dramatically since I first wrote this article. Panasonic and Olympus started the ball rolling with their Micro-4/3 format. Since then, Fuji's X-mount and Sony's E-mount have taken the world by storm. Fuji is the new darling of the photography community, while Sony seems to get most of the consumer press attention. Adapters to mate FD/FL lenses to any of the above mirrorless bodies are readily available on Amazon and eBay. I won't bother giving pros & cons of specific camera models, because they change so fast that any statement would be out of date in a month. However, I will say that if I were buying a new body today, it would probably be the brand new Fuji X-E2, although Sony's full-frame A7R is also quite appealing.